On Saturday 31st March 2012, Grant Hamston and I represented the State Library of Victoria at the 5th annual Shake Your Family Tree day, a family history event presented by the National Archives of Australia. This event was held at the Victorian Archives Centre at North Melbourne and was the first year in which the event was held on a weekend. Other participating groups included the Genealogical Society of Victoria, the Australian Institute of Genealogical Studies, the Immigration Museum, Find and Connect Australia and Public Record Office Victoria. This year’s theme was `Byte’ into your family history at the Archives – showing people how to research and preserve their family history in the digital age. At the State Library of Victoria Information table Grant and I spoke to many people and dealt with almost seventy specific queries on a wide range of topics. Such inquiries included: accessing online and microfilm newspapers, remote access, accessing databases, finding electoral rolls, access to the picture collection and wireless access to online resources. We had several inquiries about the Finding Families workshops and quite a bit of interest in the Love and Devotion exhibition. We also dealt with some very specific queries about finding Polish, Scottish, Shipping and East Indian resources. Several people looked at the Victorian Genie Guide and then asked if we could turn it into an online resource! 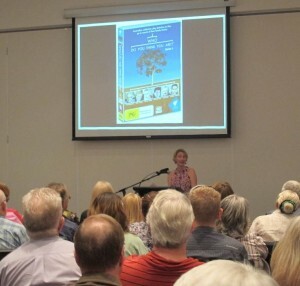 I also attended an excellent talk by the guest speaker Kirrilly Brentnall, researcher for the SBS television program `Who do you think you are?’ Kirrily spoke about the process of developing and researching the program and emphasized just how much time, money and staff hours go into creating each program. Events such as these are an excellent opportunity to promote the Library, its collections, services, facilities, programs and events, reference services and research opportunities. We received many positive comments about the Library and the Genealogy Centre from attendees such as: “The Genealogy Centre is fantastic”, “I love the newspapers”, “I have been visiting the Library since 1964 and enjoy the improvements in recent years”, “The Genealogy Centre works well” and “It’s so easy to access information in the Genealogy Centre”. Overall, the event was very enjoyable, and extremely well organised and run. We hope to see you at next years Shake Your Family Tree day.